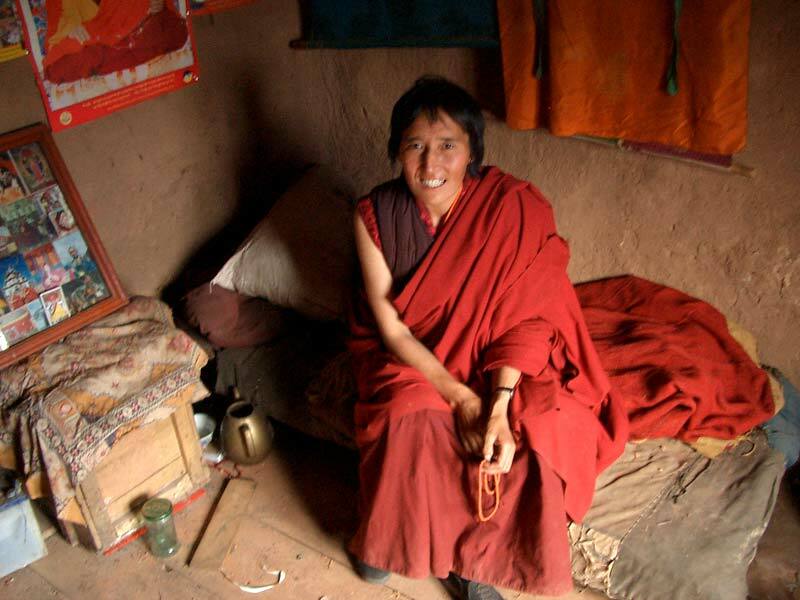 In the Tibetan culture the monastery is an anchoring point and a place of refuge for the needy. Traditionally, monasteries took in children for whom they cared and provided education, within the Tibetan Buddhist tradition, up to adulthood. It is from such a perspective that the Association supports monasteries in India and Tibet. Situated in the region of Kham in Tibet, the Nunnery was built by Chokgyur Lingpa, a Tibetan master recognised in the 19th century. On the slopes of a mountain which is considered to be one of the root traditional sites, the nunnery was constructed on a site where, for many years, Padmasambhava, who brought Buddhism to Tibet, lived with his disciples. 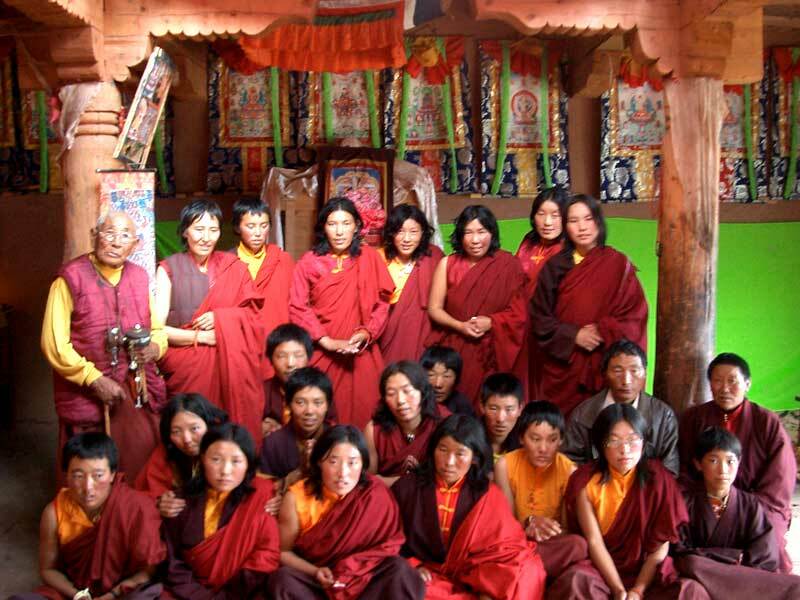 A group of 40 nuns has established here a small community : the nunnery of Tibet. Their spiritual master is Orgyen Tobgyal Rinpoche, along with Neten Chockling Rinpoche. Following a period of stay at this place, Orgyen Tobgyal told us of his astonishment concerning the nuns : he has ‘rarely seen a community as poor as this and with so little financial support, to be so dedicated to spiritual practice’. Being occupied with the monastery’s reconstruction in the valley, these two masters approached Sogyal Rinpoche for help. The latter then sent an appeal to our Association, and in 2005 we became enthusiastically engaged in this cause. Currently forty nuns live in the convent, originally from families in the surrounding villages, but they would like in the longer term to welcome more nuns. Sixteen of the nuns are on long-term solitary retreat. In charge of the community is Sherab Chimsor, aged 83, a practitioner whom everyone respects. The nuns belong to the ancient school of Tibetan Buddhism, the Nyingma tradition, more especially the tradition of teaching and meditation established by the great 19th century master, Chogyur Lingpa. The convent has a strong connection with the Neten monastery situated lower down in the valley, and receives regular visits from an erudite old monk from there for teachings and initiations in accordance with their tradition. The nuns practice two important cycles of meditation each year : a drupchen of Vajrakilaya according to the tradition of Mindrolling, a drupchen of Vajrakilaya according the tradition of Ratna Lingpa. On top of that the nuns regularly undertake Avalokiteshvara retreats, known as Nyungné, which require several days of fasting, as well as practices of KuruKulla. Before Art’Tibet Cham Sem intervened, the nuns lived especially precariously ; having at that time few financial resources, they were obliged to go and beg for food, since the native people prefer, out of religious conviction, to give their offerings to the monks rather than to the nuns. This is a situation which one encounters all too frequently and which makes the women’s daily life very difficult. The nunnery encounters a very real problem of water supply during the dry season. The nuns have to walk more than two kilometers to reach the nearest river, at a significant gradient, with the risk of falling. Art’Tibet Cahm Sem’s first intervention, therefore, was to finance a pump and canalisation to bring water up to the nunnery. Similarly, few of the nuns have their own rooms, the majority of them sleeping together in a large dormitory. The sponsors of the Association have financed the construction of small wooden chalets in order to alleviate these problems of accommodation. In order to find a solution for the daily purchase of food and other current expenses, but also with a view to gaining autonomy in the long run, the nuns would like to build several small shops in the nearest neighbouring town. These shops would be rented to local merchants, and Art’Tibet Cham Sem would finance their construction. The rental revenues would support the community. Cost for 7 shops : 700 000 renminbi (70 000 €). As of today, we have gathered the funds for the first two shops. We are hoping to be able to complete the project in the coming years. Despite a still precarious life, the nuns are determined to continue to live within their community in the mountains : it would be unacceptable for them to leave such a place where so many Tibetan Buddhist masters have lived. Also most of them have been on retreat there for many years. A number of times, Orgyen Tobgyal Rinpoche expressed his deep appreciation for what the Art’Tibet Cham Sem donors and sponsors bring to the nunnery through their generosity and solidarity. Please be sure that each person who takes part in this ‘bridge’, created between the nuns in Tibet and us in the West, is like the stone of a building with very profound human and spiritual impacts.